Some publishers started testing the water with smaller formats (Raymond Chandler was reissued in small format) but there was no common consensus yet. The sheer portability of ebooks makes a reader desirable. Yet over the years publishers have tried other book sizes. During the war American soldiers were issued with paperbacks that read vertically and could fit into a uniform pocket. Armed Services Editions, or ASEs, were paperbacks that soldiers could take with them wherever they went. Between 1943 and 1947, the US military sent 123 million copies of over 1,000 titles to troops serving overseas. By the time the war ended, they’d transformed the publishing industry, turning the cheap, lowly paperback into something civilians wanted. The idea wasn’t new; it had been around since the Italians tried it out at the beginning of the 16th century. The scale of publishing the slim titles was different, though. 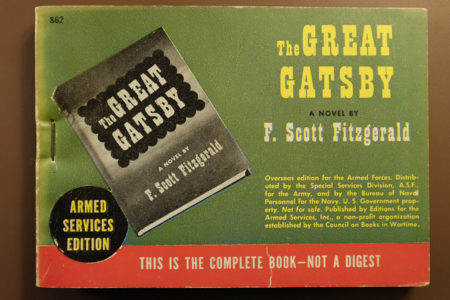 ‘The Great Gatsby’, which was not a success on first publication, became a hit with soldiers. Since then, others have tried to make the paperback appeal again. In Europe other formats exist, including a slender size that’s very compact and collectable; I recently bought a set of Ray Bradbury novels in this format but they have a problem; old paperbacks were usually much thinner and easier to open, but they fell apart after exposure to sunlight. New technology means that paperbacks rarely split into sections now, but with publishers favouring long novels it’s almost impossible to get them to stay open. Now comes a new idea; the dwarsligger or ‘flipback’. 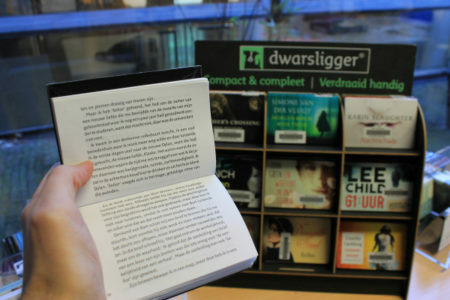 Invented in the Netherlands in 2009, they use fine onion-skin paper and the pages are flipped upwards, mimicking the swipe effect of phones. They are apparently very easy to consume and avoid the problem of trying to hold the book open. The first titles are all in the Young Adult category because the young are less resistant to change. If they sell, other titles will be produced. I think it’s a brilliant idea, and hope to see them in the UK. A lot of work published in the 40’s was printed on rubbish paper with a high acid content so they discolour and dry out. I’ve got a paperback somewhere that shows the reader licked his fingers before turning pages because you can see fingerprint shapes where the PH value was changed. This cheap paper also became brittle and easily tore. The cheap paper was made of wood and paper pulp – not rag, hence the term ‘pulp novel’. Paperbacks weren’t stitched with thread to join the sections together, so the pages fell apart. A similar thing happened in the late 70’s and 80’s where so- called ‘perfect binding’ was introduced. This was just a load of newly introduced sticky glue applied along the spine and was used in lots of high-end paperback books and catalogues. Unfortunately no-one had actually tested the glue over a long period so lots of these things just fell apart as the glue dried out. I’ve got a big Marilyn Monroe book and a ‘History of the Pin-up’ which are just a pile of individual sheets now. Also during wartime a number of publishers reduced the point size and all but removed margins, so stories were almost impossible to read. The margin allows the eye/brain to gauge the start of the next line, but if you have narrow margins you tend to read the wrong line, sometimes the one above and sometimes repeat the same line. Sorry, meant to say that the reduced type size and margins was to reduce the number of pages and hence, the print cost. A case of narrow margins making increased margins, if you see what I mean. I’m not at all sure that your claim that the Armed Services Editions “transformed the publishing industry, turning the cheap, lowly paperback into something civilians wanted” is true or accurate. Simon and Schuster invented the American mass market paperback in 1939 with Pocket Books, modeled after both the Albatross books published in Germany and Penguin in the UK. Long before the US entered WW2 paperbacks were already very popular. Pocket Books #7 was Wuthering Heights and sold 1.5 millions copies in 1939-40, making it the first best-selling paperback in US publishing history. Nary a thought to the impact of Routledge’s Railway Library? Reprints of popular novels, “For Entertainment while Travelling”, at a modest 1/- each. [The Dwarfslinger is a patented design, so extra royalty to be paid out? Not going to be popular. I can envisage the physical book vanishing completely, converging into whatever the phone/tablet/e-reader combination morphs into? I do enjoy small, thin books – Alfred Wainwright’s walking guides come immediately to mind. Loads of info, pocket sized. Shire Publishing produce an incredible (addictive) array of titles, each a skinny little volume. I’ve got loads – the scope of their titles is incredible, and on some pretty esoteric subjects, too. As a child, I used to collect the fascinating ‘I-Spy’ books, which were about 4″X5″ in size. For birthdays, I would often be given the similarly sized, but much thicker ‘Observer’ books. I still have most of them. I also have some of those ‘Perfect Bound’ books – all are now just (very) loose leaf binders. One is a collection of Ambrose Bierce stories. Published by the American ‘Dover Press’, it states on the rear cover: “This is a permanent book.” Nope. Hodder & Stroughton published a flipback series in 2011, printed and bound in Holland, 12cm x 8cm in size. I have Tinker Tailor Soldier Spy in that format, its very cute, the back is hinged, so its vey easy to read. “Dwarfslinger” would make some sort of sense (perhaps, although dwarf throwing is certainly not an acceptable activity) but the sign clearly says “dwarsligger” unless that is the Dutch version of Snowy’s phrase. ‘Dwarfslinger’ sounds like a character from one of the Norse sagas. Or even a detective from one of those bleak, but oh, so addictive Scandinavian Police proceedural shows. Erlund Dwarfslinger, Detective. Episode 1: Bodies keep turning up, with horribly mutilated hands; each body reeks of Surströmming. What is going on? Luckily, overweight, alcholic, divorced, ex solvent abuser, Detective Erlund Dwarfslinger is on the case. Unfortunately, it’s a case of whisky, and he’s out sparko, but he’s on the case. Ian, I do like that so very much indeed. Ian, I’m not sure I want to spend very much time with your brother, although I might laugh myself into a fit, but I delight in creations such as yours above.